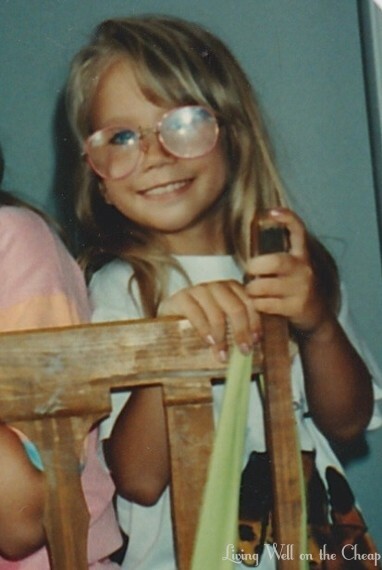 I got my first pair of glasses when I was five–and not just any pair of glasses. I’m talking giant frames and coke-bottle lenses on my tiny, tiny face. I was petite even then. I must actually be closer to six or seven in this picture because the pixie haircut I gave myself just before starting kindergarten had grown out. Coastal.com–this is where Gina bought hers. She says to sign up for their email list and wait for a promo code. She was really happy with them! Eyebuydirect.com–this is where I ordered ours. Despite some bleak reviews online they arrived in good condition in about three weeks. Zennioptical.com–online reviews of this company are actually pretty great! I went ahead and ordered new glasses for Nick, too. I just called his eye doctor and asked them to give me his prescription. He hadn’t been there in over a year so I’m surprised that they didn’t insist he come in for a new exam, but I think he’s planning on heading to Target for his next one anyway–it’s pretty convenient to get your eyes examined someplace you already frequent. I asked him if he cared what kind of frames I picked out for him and he said no, but later that evening when I showed him the full-rimmed pair I’d chosen he thought I was joking. It’s a good thing he’s not very vain because they’re definitely not what he would have chosen for himself, but I like them! I’d tried on a pair of pink girls’ frames before sticker shock set in at Target and thought to myself that maybe I wouldn’t hate wearing my glasses so much if they were fun. So when I finally got around to ordering our glasses online I went for pink. What do you think? I love them! We didn’t use our insurance for these (I’m not sure EyeBuyDirect even bills insurance, and I am not up for the task of submitting a claim myself) but even paying completely out of pocket we only spent about $80 total! It would have been half that if it weren’t for my nuclear-strength prescription, but perfect vision for the practically blind comes at a premium. If I can get myself in the habit of switching my contacts for eyeglasses every evening before bed maybe I can call myself one step closer to being an actual adult. Next task–getting myself to the dentist twice a year! I was doing well for a while there but I haven’t been since Jack was born. Speaking of the little guy, my heart is breaking at the realization that he’s probably doomed to wear glasses as well. Nick and I both HATED it and I’d rather not subject him to the same thing. Maybe by the time he’s old enough to need them they’ll have invented some miracle cure. Fingers crossed! You were SO ADORABLE! I love that the glasses were eating up your little face! I do like the pink frames. I buy my glasses from eyebuy and my contacts from coastal. And I totally understand the sleeping with contacts thing… I get scolded all the time! Haha thanks Carnisha. I’ll have to look into getting my contacts online next time! Oh no, you’re scaring me! I just got my one year old (no that’s not a typo…ONE year old) glasses and I hope she doesn’t hate them as she gets older! I spent a boatload on them, so I feel you there. Maybe as she gets older I can try ordering online. We met a one year old with glasses last weekend and he was sooooo cute! Hopefully your daughter embraces them as she gets older. I think Nick and I are a bit unusual in our hatred. I have heard great reviews for Warbly Parker as well. Oh yes, I’ve definitely heard great things about them as well! Their frames are super cute but out of my price range–might be a good option for someone who wears theirs full time though! I’m always so jealous of my friends who buy lots of glasses from zenni. I am like you and have to spend so much money on my lenses that it still would be expensive for me to get a pair through them. Everyone kept telling me to order them there that it would only cost like $20 or cheaper even. And I was like uuuuhhh you guys know that my lenses wouldn’t be free right? I think just my lenses alone were $50 at zenni and then add on whatever frames I would have picked out. I’m happy with my one free pair from eyeglass world. (And it was free with my vision insurance). I know, my lenses were an extra $40! I’m jealous of your free glasses! Coastal.com is awesome. Like their facebook page and you can get your first pair free!